In the face of the Boston Marathon bombing, several brands, and one famous Tweeter, posted on social media in ways that can only be described as dumb. And dumber. But there are some lessons for brands. Epicurious decided to use its Twitter feed to offer food suggestions to Bostonians. 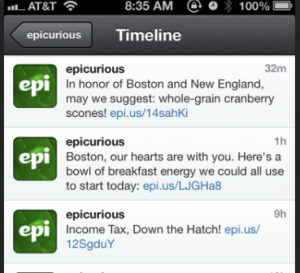 Listen up Epicurious: your Tweets didn’t seem offensive. They were offensive. And plenty of people have these screen shots, so deleting them was not the answer. 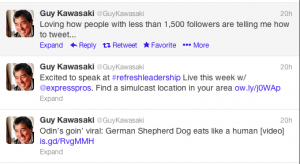 Then there was Guy Kawasaki, who has 1.2 million Twitter followers. I’ve been a big fan of his for a long time. Brilliant man! But he blew it, big-time, by robo-tweeting. Several people, including me, suggested that he stop robo-Tweeting. Contrast that with the way Boston-based Rue La La handled its website and its daily email blast. They didn’t sell anything on the day after the attack. What are the lessons for brands? Every brand, and every famous social media superstar needs to monitor what’s being said about them 24/7. It used to be a joke among bloggers that you should post on the weekend if you want to do damage to a brand because they don’t monitor on weekends. The days when brands could allow an issue to fester for days are long gone. Minutes are dog years on the Internet. For god’s sake, pay attnetion to the news! 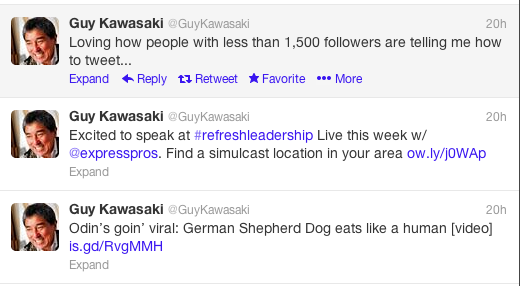 If Guy Kawasaki was paying attention to the news he’d surely have had the sense to stop the robo-tweets immediately. As forEpicurious, they appear to be hopeless. If you screw up, apologize. Everyone makes mistakes sometimes. It happens. Apologize. And mean it. People forgive a whole lot when they get a sincere apology. Hey, Anthony Weiner is looking good in the race for New York City Mayor according to the latest polls. And you all remember what the crotch shots he Tweeted, don’t you. He’s sorry, and he’s asking for another chance. And, god help us, he could end up being Mayor of New York. Email blasts also fall into this category. I got one late Monday or early Tuesday from an Internet marketer who ought to know better. 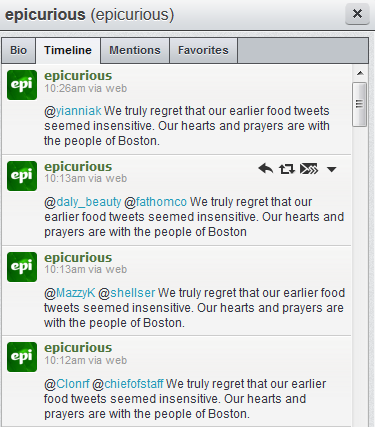 It was about how our prayers are with the Bostonians, etc. The P.S. was a reminder that registration for the IM’s coaching program was ending that night. This is a great article. Back in the days after 9/11, I sent out utterly non-promotional “we are with you” email to the subscriber list of the dot-com where I was manager of content. It was the right thing to do, but interestingly it also ended up helping our brand. Meanwhile, I remember a “those affected by the terrorist attacks can get our SaaS product for one month for free” promo email from a would-be vendor. This was maybe 9/14. I read them the riot act: “Don’t debase this moment, idiot.” The sad thing was when I told my boss what I’d done his first impulse was to worry I’d insulted a business partner. Also sad to see that even today some of us haven’t learned a thing. Also, speaking of sad: Andrew Weiner, absolutely. Thank you Eric! It really is sad that this lesson has yet to be learned by so many brands and even by iconic social media stars like Guy Kawasaki. And now Weiner is back on Twitter, home of his crotch shots. Oy vey! Isn’t that like letting Michael Vick have a puppy?